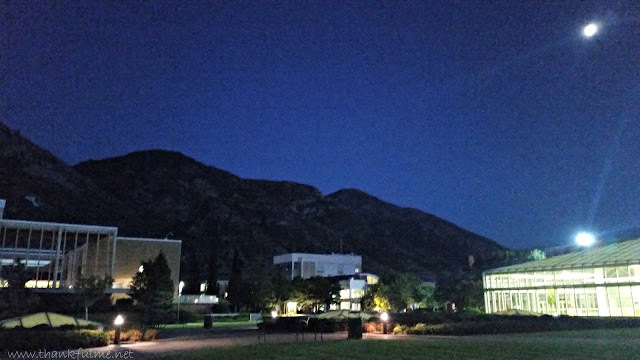 If you've been following my blog for a while, you know that Brigham Young University holds Education Week one week every August--and you know how much I look forward to attending Ed Week each year. This year was no exception! 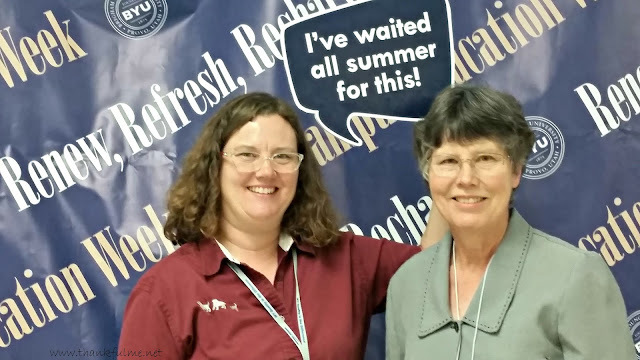 Photo: My mom and I stand in a Education Week photo booth, holding a sign that says, "I've waited all summer for this!" Monday's schedule was different than Tuesday-Friday. (I imagine that is because there are no evening classes or performances scheduled for Monday night, which is set apart in the church as family time.) Anyway, on Monday morning I attended a series of classes all about the Mormon Tabernacle Choir. I heard one woman's experience in trying out multiple times before finally making it into the choir; I learned about one man's job of booking guest soloists to perform with the choir; and I learned about the choir's recent European tour. Monday afternoon, I attended two classes: one about finding peace in troubled times and another about Old Testament patriarchal names as witnesses of Christ. After a "heavy" afternoon schedule on Monday, I decided to lighten things up on Tuesday morning, so I attended "Physics is More Fun than You Think." Then I went to a class about some of the digital resources the church has (more on that later). The highlight of Tuesday was a devotional address given by Elder Jeffrey R. Holland on the importance of religious freedom. He was the president of BYU when I was attending school there, and hearing him speak in the Marriott Center certainly brought me back a few years. I'm embedding a video of his talk. It is long, but worth a watch. Tuesday afternoon, I learned about the power of music to heal, religious freedom, and types and symbols found in the scriptures. Wednesday through Friday I spent in mostly the same classes as Tuesday. I did not attend classes in the evening (although they were available), instead preferring to spend time with youngest son, who lives in the area. 1. I'm thankful for Brigham Young University for hosting Education Week each year. They fit it into the university schedule, right between summer graduation and the start of fall semester. It must be a logistical nightmare, but somehow, it works. 2. I'm thankful for all the people who keep smiles on their faces. From the presenters, to the volunteer room hosts, to the student cafeteria workers, to the long lines of attendees waiting to enter a classroom with a particularly popular instructor, everyone was pleasant, patient, and polite. 3. I'm thankful for a sweet image that will live in my mind, but that I didn't dare document with a photo. One afternoon, upstairs in the student center, I noticed a frail, white-haired elderly man, with oxygen tubes, sleeping on a couch, with his wheelchair parked next to him. He was obviously plumb tuckered out from attending classes and just needed a nap. It was a sweet scene, and a testimony of the dedication he had to even attend Education Week. 4. I'm thankful for something that one of the presenters pointed out, and which I think fits perfectly into a TToT/blessings list. He was mentioning how we have so much for which to be grateful, from the big things, to the little things that we take for granted. His specific example was the fact that by opening our mouths and inserting food into them, we can keep our bodies nourished and alive. What a simple, yet miraculous thing eating is! 5. I'm thankful for The Book of Mormon--not the musical, the actual book. It, together with the Bible, teaches me about the love Jesus Christ has all of us. 6. I'm thankful for the accessibility of scriptures. (Here's the "more on that later" I mentioned earlier.) Though the church has a digital "Gospel Library" app, I didn't realize until this week that there is a stand-alone "Book of Mormon" app produced by the church. If you've ever been curious about the Book of Mormon, but didn't want anyone to show up on your doorstep to discuss it, this app is perfect for you! It is free, and the book can be read in LOTS of different languages. There is even audio for, I think, 6 languages, or you can watch a video of it in American Sign Language. Another great feature is there is a chat feature, so if you do have a question about something, you can anonymously ask and get an answer. Anyway, no pressure, but I did want to let you know in case you'd like to check it out. 7. I'm thankful for the freedoms we enjoy here in the United States. I can talk freely about my religion without fear. We don't have to see eye-to-eye to be civil. The 11th Article of Faith states: "We claim the privilege of worshiping Almighty God according to the dictates of our own conscience, and allow all men the same privilege, let them worship how, where, or what they may." It's only fair that if I want to be able to freely live my religion that others be granted that same right. Society is stronger with the freedom of religion. 8. I'm thankful for the fact my mom was able to come to Education Week again this year. For one reason or another, it had been a while since she was able to go, and I was glad she was able to make it this year. We stayed in the dorms--youngest daughter and me in one room, and my mom and one of her friends in the room across the hall. I'm thankful to have gotten to know her friend this week, too. We enjoyed several meals together. 9. I'm thankful for the chance I had to spend time with youngest son. He's a lot of fun, and kept us smiling. 10. I'm thankful for John. I sure missed him while I was gone. Even though I love Education Week, I love coming home to John. He was so sweet; there were flowers waiting on the table when I got home. I was the one on vacation; he was the one who stayed home and worked, and yet he got flowers for me. Totally unnecessary, but such a nice welcoming. How was your week? Want to come to Education Week next year? I remember the 'Y'! (Back a few years ago when there was an annual conference in SLC). sounds like a very good week. I hiked up to the Y several times in past years, but haven't done that hike in a long time. Freedom. Yes. Very important we all have that. Sounded like a lovely week you had with your kids and your mother though. Nice to come home too. Awww, flowers. I did have a great week! Sounds like you had a wonderful week. Number 3 is so touching and while I understand why you couldn't post the photo you certainly did paint the picture with words. Have a great week!